Tuesday was take two for Education Secretary Betsy DeVos’s defense of her school safety and choice proposals, this time to parent advocates. 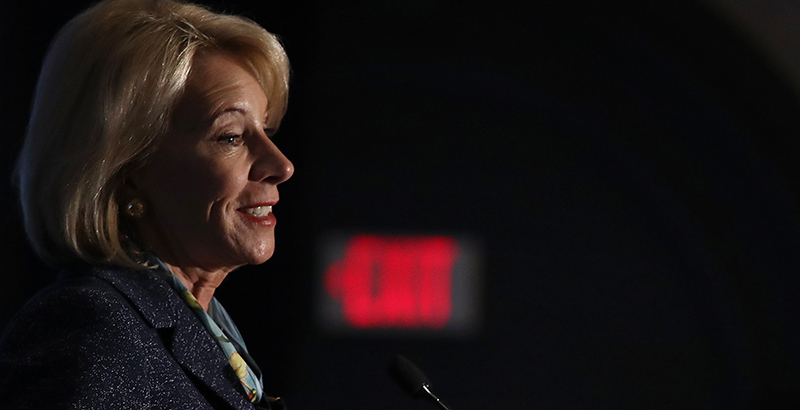 DeVos, fresh on the heels of a much-criticized media blitz Sunday and Monday, spoke to the National PTA’s annual legislative conference in suburban Washington, D.C., and it was not totally friendly territory. The group officially opposes private school choice initiatives like the ones DeVos has championed, and it backs such gun control measures as requiring waiting periods before gun purchases and banning internet sales. School choice has been the focus of DeVos’s advocacy for decades. It was the source of much of the controversy that has surrounded her nomination and tenure, and it caused some of the most contentious moments of her 60 Minutes interview with Leslie Stahl Sunday night. The idea that mediocre results should spur action shouldn’t be controversial, DeVos said Tuesday. “Now that I have the opportunity to speak unedited, I’m not afraid to call out folks who defend stagnation for what it really is: failure,” she said. Her backers have said that the 60 Minutes interview was deceptively edited. DeVos didn’t directly mention the interviews in her remarks to the PTA Tuesday, nor did she she take questions from reporters. Reforms in Michigan, which she championed and tried awkwardly to defend during her exchange with Stahl, are working, with charter school students outperforming their district counterparts, she told the PTA. But, she added, they haven’t gone far enough, and students are paying the price. “That’s borne out in the data. Fourth-grade reading and math scores are essentially a flat line, while states surrounding Michigan offer parents more choices and see improving student achievement,” she said. Her usual argument that taxpayers’ education dollars should fund students, not school systems, wasn’t well received. The National PTA’s official position is that “private school choice systems have detrimental effects on our public school systems. Public dollars must remain invested in public schools for the benefit of all students and the future of our nation.” The group supports public school choice, such as charter schools. “She posed a lot of questions, but we really didn’t see any solutions that directly dovetail with National PTA positions in the same area. 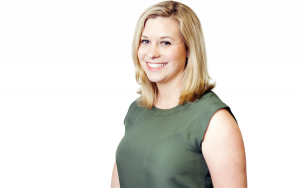 I still think we’re probably pretty far apart on how to reach some of the common goals we have,” said Cathy Nathan, advocacy director at the Minnesota PTA. There was slightly more agreement on gun safety. PTA members will be on Capitol Hill Wednesday lobbying for the STOP School Violence Act, which gives grants for violence prevention programs, and a bill to encourage more reporting to the federal background check system, Nathan said. Both are part of the Trump administration’s school safety agenda. The PTA will also advocate for a bill ending a ban on federal funding of research on gun violence, Nathan said. President Donald Trump has at times seemed supportive of — and then backed off — stricter gun control measures like the ones the PTA supports, including requiring background checks on purchases outside of those at licensed dealers. The Senate considered, but ultimately didn’t pass, a bill to do so in the aftermath of the 2012 Sandy Hook school shooting. The PTA listed “gun violence protection,” “universal background checks,” and “assault weapons ban” as among the issues it lobbied Congress on in the third quarter of 2017, according to the most recent federal disclosure available. The 3.7 million–member organization spent $33,499 in the quarter on all issues.